This article offers three explanations for the recent strong performance from high-yield BDCs, three reasons why they’ll likely underperform going forward, we consider three counterpoints to our thesis, and we highlight three specific BDCs (Prospect, Main Street and Fidus) that seem particularly overvalued right now. Finally, we offer 7 specific high-yield REIT ideas (ranked from best to worst) that offer an attractive alternative for income-focused investors. The market can remain irrational longer than you can remain solvent. –John Maynard Keynes. Business Development Companies, as measured by the BDC ETN (BDCS), were are up 25.1% over the last year (total return) versus the S&P 500 (SPY) gain of only 16.6%. For more perspective, the following chart shows the one-year total returns for the largest BDCs versus the S&P500 (SPY). They’ve all outperformed significantly (except for FSIC, which missed earnings expectations last quarter). And of the largest BDCs that have been around since the depths of the financial crisis (i.e. over the last eight years), they’ve all significantly outperformed the S&P 500, as shown in the following chart (except for Prospect Capital, which did still deliver healthy returns). There are several reasons why BDCs have performed so well in recent years, including low interest rates, a favorable regulatory environment, and the existence of many lucrative distressed opportunities. For starters, the prolonged artificially low interest rate environment since the financial crisis has pressured many income-hungry investors to buy high-yield BDCs. The US Fed was trying to stimulate the economy with low interest rates that would force investors off the sidelines (e.g. out of savings accounts, treasuries, and low-risk corporate bonds) and into aggressive growth investments that would spur economic growth (e.g. BDC’s exist to help grow small and mid-sized businesses). The regulatory environment has been favorable for BDCs. Specifically, BDCs have had little competition from the banking industry since the financial crisis because regulations were forcing big banks to de-risk. And as banks moved away from the distress opportunities, BDC benefitted. In fact, a big part of the reason BDCs have been able to put up such great total returns in recent years is because the market was filled with lucrative, high-yield, high-ROE distressed opportunities, and there was essentially no competition from the banks. For many small businesses that needed access to capital, BDCs were the only option. And because BDCs took advantage of these opportunities, they have been able to deliver big attractive returns for investors. High yield market distress in early 2016 is the main reason BDCs have delivered such strong returns over the last year. In particular, low energy prices caused heightened default-risk in the high-yield energy debt markets, and BDCs sold off right along with energy debt. Essentially, the strong one-year returns for BDCs is because the prices were much lower one-year ago. In fact, they should not have been as low (in our view) because the selloff was inappropriately tied to the distress in high-yield markets caused by energy companies (this distress impacts BDC differently based on their book of business, but the market indiscriminately sold off). For more perspective, this next chart shows high-yield spreads, which are basically the difference in yield between riskier high-yield bonds and safe US treasuries. Remember, BDC portfolios essentially consistent of higher risk loans and financing arrangements (similar to high yield bonds). And as the chart shows, the spread was significantly higher in early 2016, which is not-coincidentally the time when BDCs were trading at much lower prices. Also important, the spread was extremely high in 2008-2009 (i.e. the financial crisis), and this has benefitted BDCs significantly as they were able to make loans in the years after the crisis that appeared very risky at the time (thereby providing high yields), but proved quite lucrative as the markets have since recovered thereby providing outstanding returns for BDCs. BDCs have been great performers recently, but we believe they will be challenged to deliver similar strong returns going forward because competition will be stronger, distress opportunities are not as pervasive, and valuations are already high. BDCs will face increased competition on multiple fronts. First, with almost all banks now passing regulatory stress tests, they have more freedom to choose opportunities that will be more lucrative to them (for example, providing capital to middle market companies thereby providing some increased competition for BDCs). Also, the new Trump administration seems focused on rolling back regulatory “burdens” in general, which could mean more competition for BDCs from banks. Also, with the “zero interest rate environment” now in the rear view mirror, and interest rate expectations continuing to rise, investors may be more comfortable with the improved yields offered by corporate bonds (and other income-paying securities) in the coming years thereby putting selling pressure on BDCs which were formerly one of the few higher yield opportunities available. Special dividends may be reduced or eliminated by many BDCs going forward because the high return-on-equity distressed investment opportunities (i.e. buying distressed assets for cents on the dollar) may be largely gone for now (until the next market crisis anyway). Many BDCs have achieved very high ROE in recent years (in addition to net investment income) because the market distress allowed them to make some very lucrative deals. It seems far fewer of those types of lucrative distressed opportunities are available now, and so too will special dividends be less common, in our view. As the following chart shows, BDCs are now trading closer to the higher-end of their historical price-to-book values, an indication that they may have less price appreciation potential via multiple expansion as they have experienced in recent years. Plus, with less opportunities (less distress) and more competition (less regulations and growing higher-yield alternatives), BDC’s will be very challenged to deliver the type of returns they’ve delivered in recent years, and many investors may end up being disappointed. To briefly play “devil’s advocate,” we could argue that BDCs will continue to perform well going forward because increasing interest rates will benefit BDCs in much the same way they benefit banks (i.e. widening net interest margins will improve bottom-line profitability). After all, many BDCs have a favorable amount of floating rate interest payments coming in but their own debt payment are fixed. However, let’s not forget that the strong recent historical gains for BDCs have been driven not just by interest income, but also by strong asset appreciation (for example, realized gains on investment exits). And the strong gains have been fueled by markets rebounding from distress. And as we saw in our earlier high-yield spread graph, there is far less distress in the high-yield market today than there was in early 2016 and as conditions improved following the financial crisis. Just as high-yield bonds trade much more based on company-specific fundamentals than they do on interest rates, BDC’s total return opportunities are not driven by interest income alone (asset valuations matters). I'm encouraged by some of the chatter that I'm hearing on AFFE, and we certainly welcome changes to the AFFE rules and regulations. The second element to bring forward is 18f-4. In short, 18f-4 is the disclosure that requires the definition of senior securities, specifically unfunded commitments and the calculation and termination of the impact on loan funding commitments when you derive asset coverage ratios. We remain hopeful and encouraged that the SEC, after many discussions, is moving forward with a potential provision on filing providing clarity on the calculation and description and disclosure regarding 18f-4. We remain hopeful and looking forward to that. Lastly and one most important provisions that I truly care about is congress taking up the provisions of the 3% limitation rules. Clearly, 3% limitation rule has an unexpected consequences, thereby limiting institutional investors from owning greater than 3% of a registered investment advisor or closed-end funds, which is a BDC. By removing the 3% ownership rule or amending that to allow a certain institutional investors to own greater than that, but I believe that you will see a dramatic benefit and the realignment of external management fees as well as a consolidation of the BDC industry. It will be a welcome change to the industry itself. These regulatory changes could certainly benefit BDCs, but in our view they are wishfully optimistic probabilities, and there are still fundamental things happening (e.g. where we are in the market cycle, and high valuations) that will be much larger drivers of future BDC performance, in our view. Yet another counterpoint is that BDC investors are far less concerned with prices than they are with income. Some investors believe that as long as they receive the income payments, then the price is practically irrelevant. However, if you buy a BDC with a 10% dividend yield and its price falls 15%, did you really get a 10% yield on your investment? We’re not calling for a 15% decline in BDC prices, but they have rallied hard, and if high-yield markets show any signs of weakness, BDCs have a track record of selling off hard. Prospect offers a big 10.6% dividend yield, but its price seems particularly expensive, in our view. For example, here is a look at PSEC’s price to book value in recent years. As the chart shows, PSEC’s discount to book value has almost entirely dissipated since early 2016. This isn’t to say PSEC’s dividend is in dire jeopardy (we don’t believe it is), but the potential for PSEC’s price to deliver subpar returns seems increased, especially if the high-yield markets were to experience even a small bump in the road which could send valuations sharply lower quickly. Further, we believe PSEC’s return on equity (ROE) should be lower going forward because it has less opportunities to experience investment valuation gains than it did following the early 2016 distress (as well as in the years following the financial crisis distress). For example, this next chart shows PSEC’s ROE was strongest following periods of distress (i.e. early 2016 as well as the financial crisis), and considering high-yield spreads are relatively low now, the opportunities for gains seem lower. For further perspective, these next two charts show PSECs Net Investment Income per NAV has been coming down, and we believe it’ll stay down because the pie chart shows there are less legacy assets from the financial crisis. Specifically, we believe the high return opportunities on financial crisis vintage year assets are rolling off PSEC’s books thereby keeping NII per NAV lower going forward. Also worth considering, PSEC’s current short-interest is not insignificant. Specifically, short interest is currently around 7.5%, suggesting a significant amount of investors are betting against PSEC. And for added perspective, we sold our shares of PSEC earlier this year (to make room for better opportunities) as described in our article: Prospect Capital: Big Dividend, Big Risks. There are a lot of things to love about Main Street Capital. Its current valuation is not one of them. As the following chart shows, MAIN’s price to book value has increased dramatically in recent years. And for reference, this next chart shows MAIN’s price to book value is essentially the highest in the BDC space. Main Street’s premium price-to-book is not without some good reasons. For example, it is known for its exceptional internal management team, and its impressive track record of making smart investment decisions. In fact, we wrote about the many attractive qualities of Main Street about one year ago in this article: Main Street Capital: Big Yield, Diversified Risks. However, since that time, Main Street has returned nearly 37%, and we believe its price appreciation potential from here is decidedly less attractive than it was. One reason Main is less attractive is its valuation. In addition to its high price to book value (as mentioned above), it also has diminished ROE opportunities ahead. For example, this next chart shows MAIN’s historical ROE. Not only has ROE been trending lower in recent years (it briefly bumped up following the high-yield market distress of early 2016), but we believe it will stay lower because there are less distress opportunities in the market today by which to generate gains. Further, we expect MAIN’s attractive track record of paying supplemental dividends will be reduced going forward given our expectation of less asset valuation gain opportunities. Also, this next chart shows Main Street’s sharply decreased dividend yield. A BDC’s dividend yield sends a signal about its valuation. For example, the market is suggesting this dividend is very safe considering the price has been bid up so high, and the dividend yield has (by mathematics) fallen significantly lower. However, MAIN’s dividend yield is dramatically lower than many of its peers suggesting to us the market may be getting a little carried away with its assessment of Main Street’s value. Main Street is a well-run internally managed business, but it still faces many of the same risks and challenges as its BDC peers, as we have discussed earlier. Main Street is essentially a very well run business in a challenging space. Fidus is another well-run BDC that offers a big dividend yield (+8.7%) but seems expensive considering current market conditions. For background, the company provides customized debt and equity financing solutions primarily to lower middle market companies based in the US. Fidus also enjoys a competitive advantage via its two SBIC licenses. Considering Fidus’ relatively small market cap ($410 million) these SBIC licenses have the ability to move the needle (SBIC licenses provide a long-term committed funding facility, and access to low cost, fixed rate, long-term funds). Fidus also has a well-diversified portfolio and a history of attractive dividends payments, as shown in the following charts. However, here is a look at the company’s current and historical price to book ratio. The price to book has been strongest in the recovery years following the financial crisis and following the distress of early 2016, largely because that’s when more attractive high-yield opportunities were available, and the company experienced gains as markets recovered. However, Fidus now trades at a premium to its book value, and we believe the company will face many of the same challenges as its BDC peers in the years ahead (less distress opportunities to generate high gains, more competition, and a valuation that is already relatively high). The following table contains more information on Fidus and the entire BDC space. We don’t see an imminent collapse of BDC dividend payments, however we do believe prices are at risk (i.e. we believe BDCs are set to underperform the rest of the market). If you are an income-focused investor, and you’ve owned your BDC shares since the prices were much lower, then you may not care if the prices decline (as long as you keep receiving those big dividend payments). However, if total returns (dividends plus price returns) are important to you, then you may want to consider diversifying some of your assets into alternative high-yield opportunities where the potential for price appreciation is greater. Understandably, many investors are not excited about traditional fixed income investments because interest rates are so low and rising (as rates go up, bond prices go down). Also understandably, many investors are not excited about high-yield stocks because they usually involve much more volatility and risk than bonds. However, healthcare REITs is one corner of the market that risk-averse income-focused investors may want to consider. 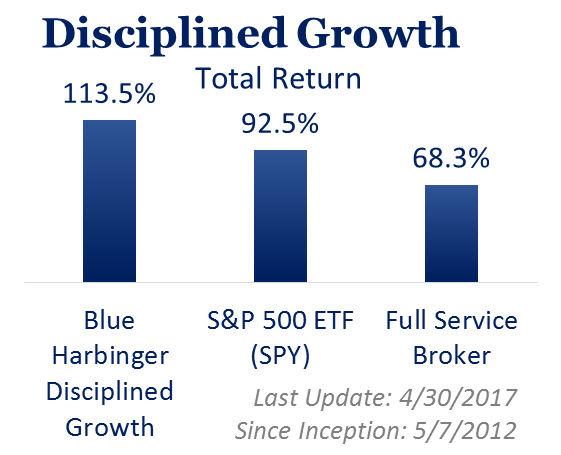 Want access to Blue Harbinger's current holdings and 100% of our members-only content?